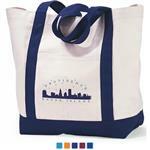 The Landon Custom Pocket Tote bag available in a wide variety of colors. One of our best selling designs. Constructed of durable 600D PolyCanvas with vinyl backing. 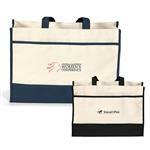 Features a large main compartment, an outside pocket and large straps - 24 inches in length. 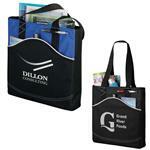 A well constructed promotional tote bag that is a great value. Available Colors: White/Black, Black, White/Royal Blue, Royal Blue, White/Forest Green, Forest Green, White/Navy, Navy Blue, White/Red and Red. Available Imprint Options: Screen or Full Color Imprint. 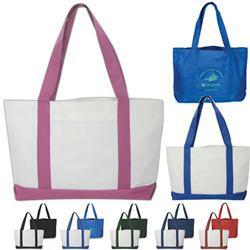 600D PolyCanvas Tote Bag with Pocket. 30 pounds per 50 units.